JACKSONVILLE — Sports agent Neil Cornrich was at his Cleveland-area office in 2001 when he received the telephone solicitation. "Hi, Neil, my name is Steve Neal, and I'd like to play pro football," said the quiet-spoken caller, two years out of college. Many barstool Pro Bowlers have similar dreams. The agent's first reaction was skepticism. "I thought, 'Well, I'd like to play, too,' " Cornrich says. "But I have no shot, and I'm probably a better athlete than you.' "
Sunday in Super Bowl XXXIX, Neal will start at right guard for the New England Patriots against the Philadelphia Eagles. It's the unusual tale of an athlete who never played college football but used his talents on the wrestling mat to earn two NCAA titles for Cal State-Bakersfield and win a 1999 world freestyle wrestling championship in Turkey — far from NFL glory. "I always thought I was going to be able to do it. Whether or not you get the opportunity, that's another thing," says Neal, 28, who was a linebacker/offensive lineman at San Diego High School. Neal had one precedent going for him. Carlton Haselrig, who won three NCAA Division I wrestling titles at Pitt-Johnstown, did not play college football but became a Pro Bowl guard for the Pittsburgh Steelers in 1992 before his career was ended amid substance abuse problems. Through Cornrich — who got over his initial doubts — Neal found opportunity with the Patriots, a team known for finding ways to find talent. He has made the most of it despite shoulder injuries that set him back the past two seasons. But to say he started from scratch is an understatement. Patriots coach Bill Belichick recalls Neal's first training camp as a free-agent defensive end in 2001. "When I tell you he didn't know where the field was, he didn't know where the field was," Belichick says. "He didn't know how to put his pads on. He didn't know where to line up. ... We're starting from below scratch." The 6-4 Neal has bulked up to about 300 pounds since his days as a 265-pound international wrestler of the year in 1999. His bank account is heftier, too. A world champion wrestler can earn about $40,000 to $50,000 in bonuses and training stipends from USA Wrestling and the U.S. Olympic Committee, according to USA Wrestling. Win Olympic gold, which brings more bonuses, and it's about $50,000-$60,000. Neal is making a base salary of $455,000 this year, not counting playoff bonuses. After next season, he becomes a restricted free agent. "I've never really been about trying to get a big paycheck," he says. "I wrestled for pretty much nothing, and football was always something I've dreamed about doing." Wrestling develops skills that translate to football: leverage, balance, explosion and hand fighting. Buck Rasmussen, a defensive lineman on the Patriots' practice squad and a former state high school wrestling champ in Nebraska, sees that in Neal. "He uses leverage to his advantage a lot, body position and stuff like that. ... Wrestling really helps," Rasmussen says. Top high school wrestlers in the upper weight classes, who excel at football, typically forgo college wrestling. For Baltimore Ravens linebacker Ray Lewis, a two-time Florida wrestling champ in high school, it was all football at the University of Miami. Neal had no big-time football offers after high school. After finishing fourth in California as a 189-pound senior, he opted to wrestle at Division I Cal State Bakersfield, where he was 83-0 over his final two seasons as a fast-growing heavyweight. In 2000, coming off arthroscopic shoulder surgery, Neal lost in the finals of the Olympic trials to Kerry McCoy of Penn State. 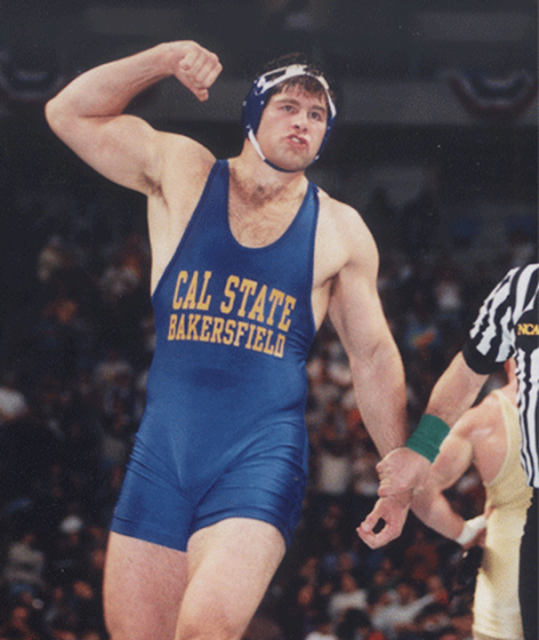 In 2001, Neal again lost to McCoy in the world team trials. Thus the phone call to Cornrich. "I asked him if he'd played college football, and he said no," Cornrich says. "Then I said, 'Well, what makes you think you'd be a suitable candidate to play in the National Football League?' And he said he was a fairly good wrestler." Cornrich, a wrestling buff, realized the caller was actually Stephen Neal, the name Neal typically uses and the heavyweight Cornrich had seen win his first NCAA title, at Cleveland State. Cornrich had watched the tournament with former NFL players John Frank and Kirk Lowdermilk, who were impressed by Neal's explosiveness. "We're sitting there watching every one of his matches going, 'Gosh, this guy could be a great NFL player,' " Cornrich says. After the call, Neal flew to Cleveland and joined Cornrich on a 5 a.m. drive to Ohio State, where then-Buckeyes strength and conditioning coach Dave Kennedy was working out players. Patriots linebacker Mike Vrabel was also there that day. Neal "showed up with a pair of wrestling shoes and some shorts and stuff, and I said, 'Well, we have to get you outfitted to look like a football player,' " Vrabel says. "I gave him some shoes and stuff, and from that first time he went and did a drill you could see he had the potential." Cornrich, who describes himself as a "close friend" of Belichick and has represented him on some matters, got Neal a tryout with New England. After Belichick and player personnel boss Scott Pioli got a look, they signed him. The road to NFL success took many turns. As a defensive end, Neal was cut by the Patriots in late August of his first camp. He spent most of that season on the practice squad of the Eagles, switching to offensive line and learning as he went. The Patriots still had faith in him. On Dec. 12 of that season, New England signed him to its roster. Although he was listed among the game inactives for all three playoff games that season, he got a Super Bowl ring. Improving quickly in 2002, Neal started against Green Bay on Oct. 23 and injured his shoulder. He had surgery and a later follow-up procedure that sidelined him for the rest of 2002 and 2003 — picking up another Super Bowl ring even though he again spent the game in street clothes on the sideline. "I was kept around here for a few years and really given the opportunity," he says. "I came here (last season) and I watched some film and I talked to the guys and tried to get better, improve." This year, Neal was promoted to a starting role for the third game. "It is a wonderful story about a guy that with hard work, dedication, overcoming the setbacks of the injuries and the lack of playing experience, has turned into, really, a good football player," Belichick says. The wrestling world hasn't forgotten him. USA Wrestling has featured a story about Neal on its Web site. The National Wrestling Hall of Fame in Stillwater, Okla., hopes to get one of his NFL jerseys. Mitch Hull, director of national teams for USA Wrestling, has talked to Neal about that jersey for the wrestling hall. "I told him, 'Hey, if you have any contract problems, you can come back to wrestling. ... We've got $40,000 out there for you.' "
Unlikely as that might seem, Neal says he just might return to the mat after his NFL days are done. "I'd love to," he says. "The weight class is 263 pounds, and I'd like to get my body back down to that weight. "I don't know. I might be too old by then. I might be too beat up. But it's a dream." He already has fulfilled a few.